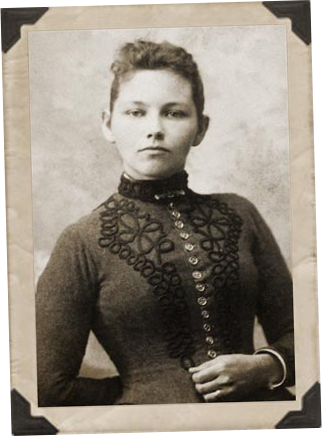 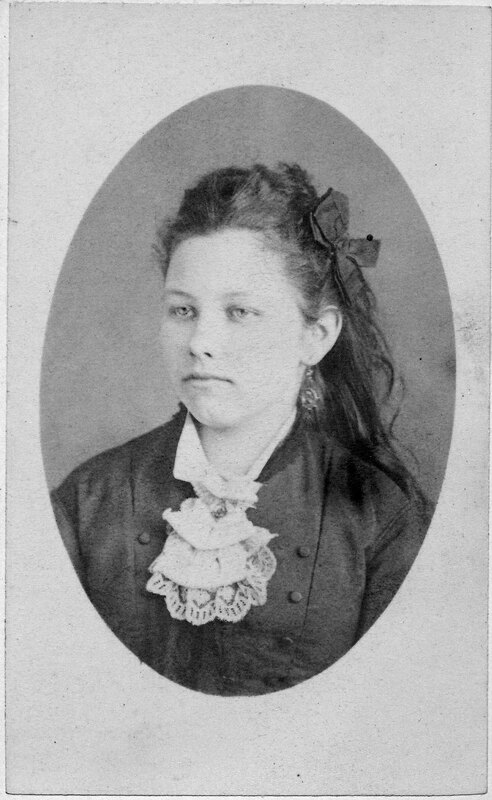 Portrait of Frankie (abt 1883)Frances Jane "Frankie" Dodge was born on 29 Jun 1862 in the small village of Petersburg in Springfield Township, Mahoning, Ohio, to parents Rufus Dodge and Sarah Bryant.3 Frankie was the 2nd of 3 children, all daughters. 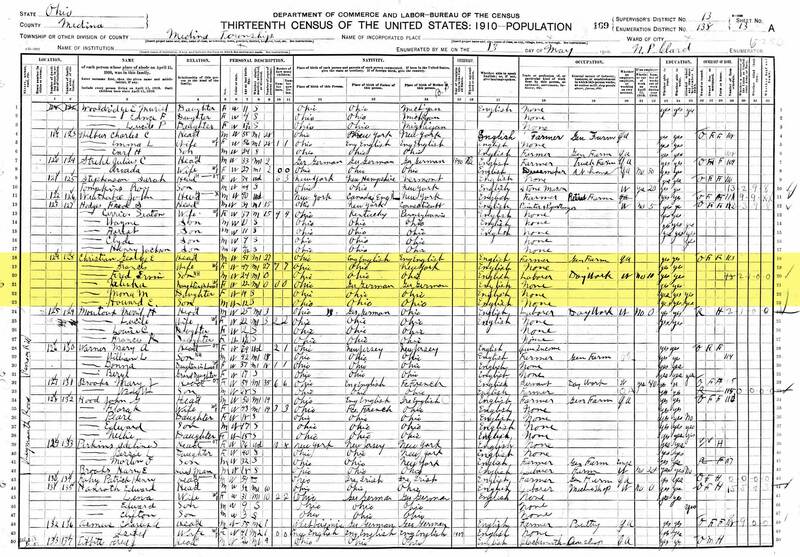 Interestingly, the 1900 census describes that George spent 2 months unemployed in the previous year.6 This information combined with the knowledge that George was a longtime sufferer from Bright's Disease (an archaic term which referred to any kidney disease that produced albumin in the urine) leads me to believe that George needed to be his own boss. 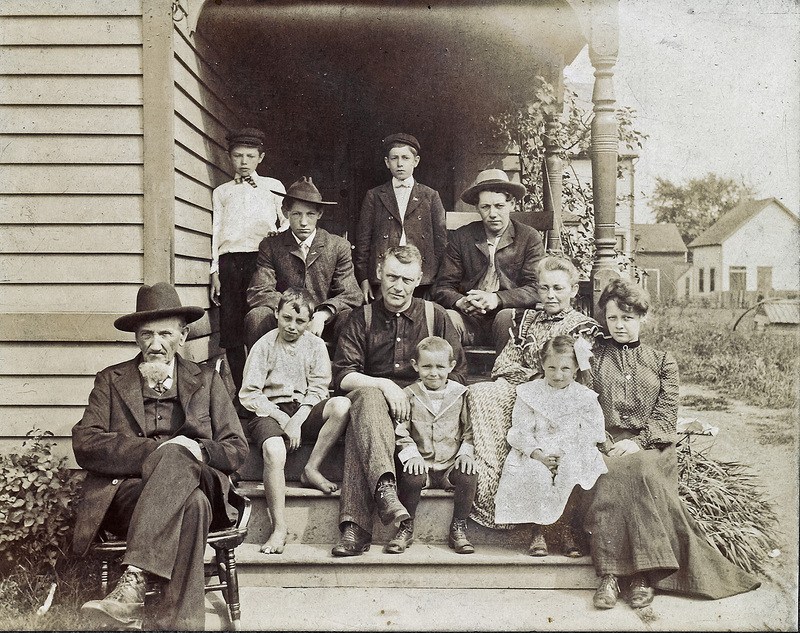 In September 1903, the Christian family sold their home on 11 Gregg Street and moved out to Weymouth Township, Medina, Ohio. 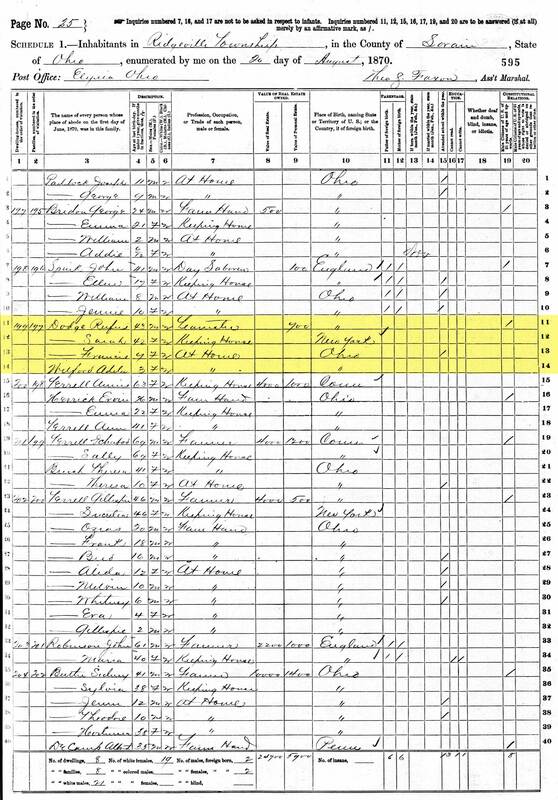 Here they bought a house near the intersection of Old Weymouth and Remsen roads where George took up work as a general farmer. 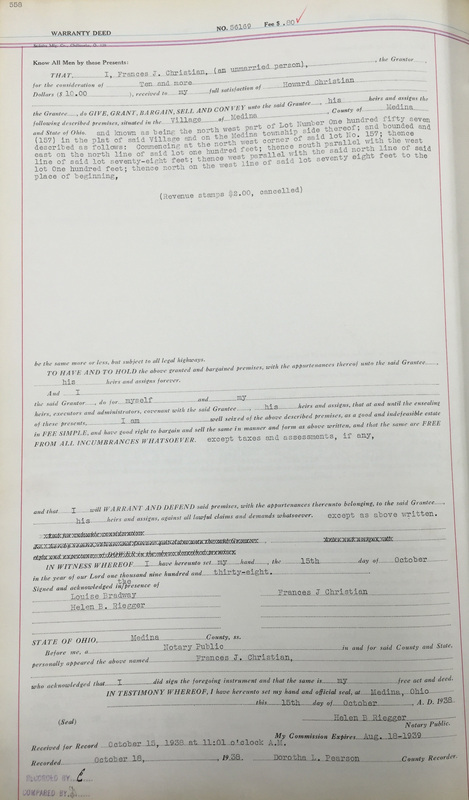 Whether this move was a medical decision or not remains unknown. 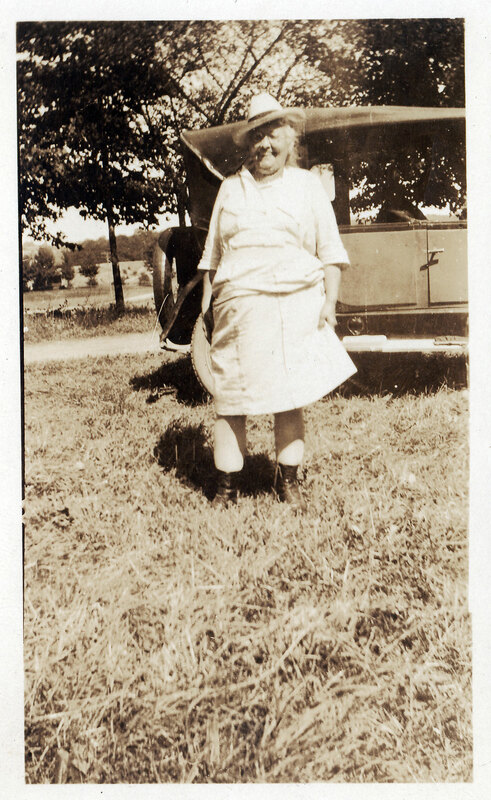 Frankie spent the later years of her life playing with and helping raise her daughter Mona’s children. 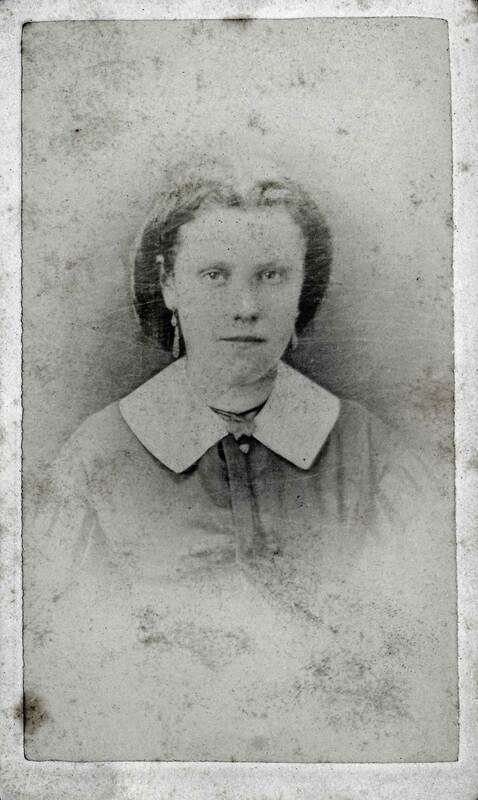 She sold the family home to her son Howard on 15 Oct 1838. 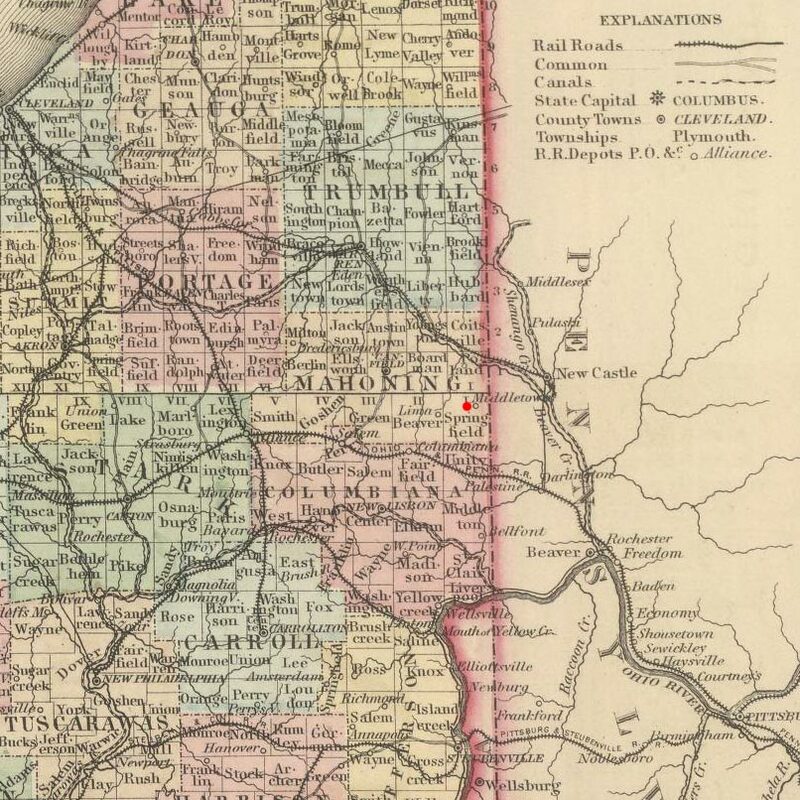 A The birth returns of Frankie's children, Mona and Howard "Pete", state that Frankie was born specifically in Petersburg, Ohio not the general township of Springfield as commonly stated. 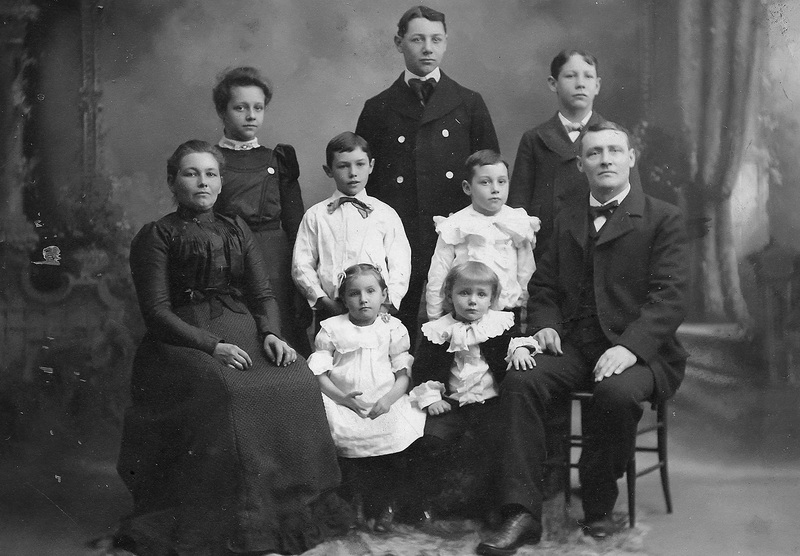 B Petersburg used to be the principal village of Springfield township early in its history. 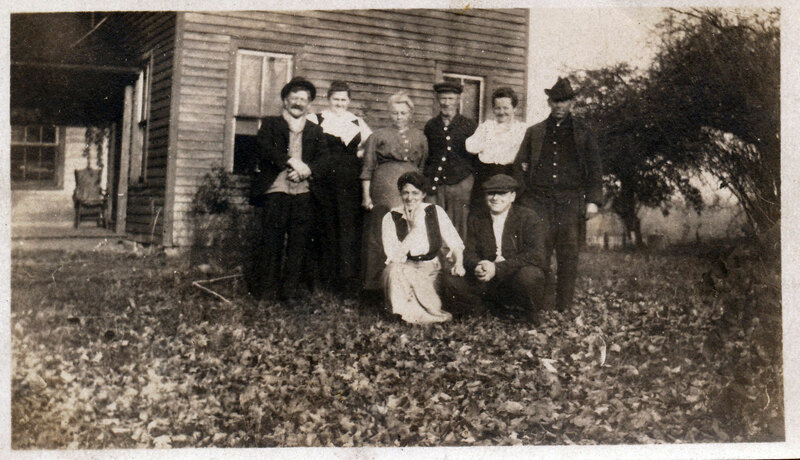 Many business that were in Petersburg included a grain mill, creamery, butcher shop, coffin shop, millinery, drug store, 2 grocery stores, a liquor store, blacksmith shop, three churches, a barber shop, veterinarian, violin maker, Warner's Inn, the Mahoning House, Petersburg Inn, hardware store, and many other little shops of general merchandise. 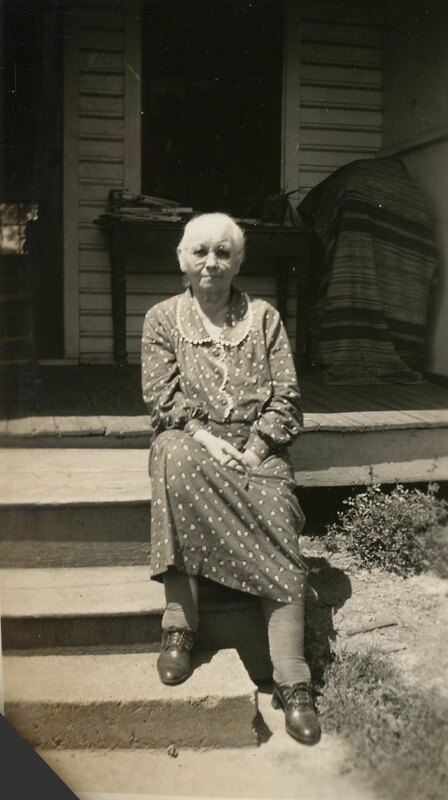 Today, it's a small unincorporated community of little note. 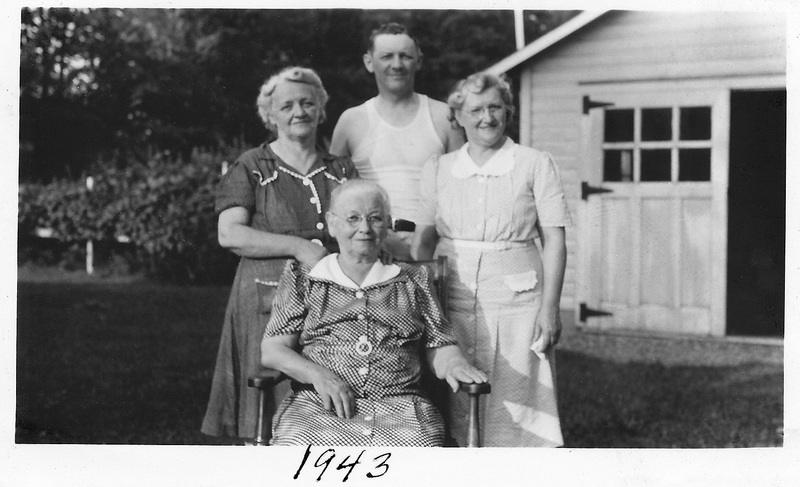 At some point Pete moved out of the family home at 240 N. Huntington and into a place off Friendship St NE of the town square. 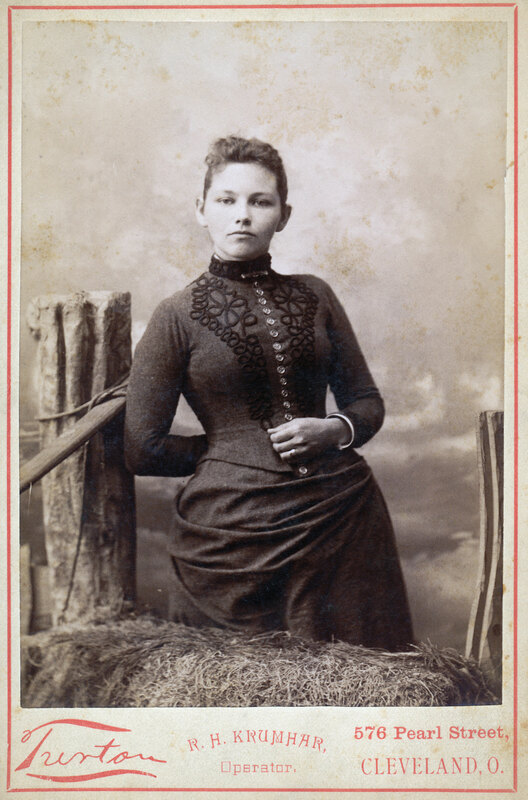 I'd like to know when that was. 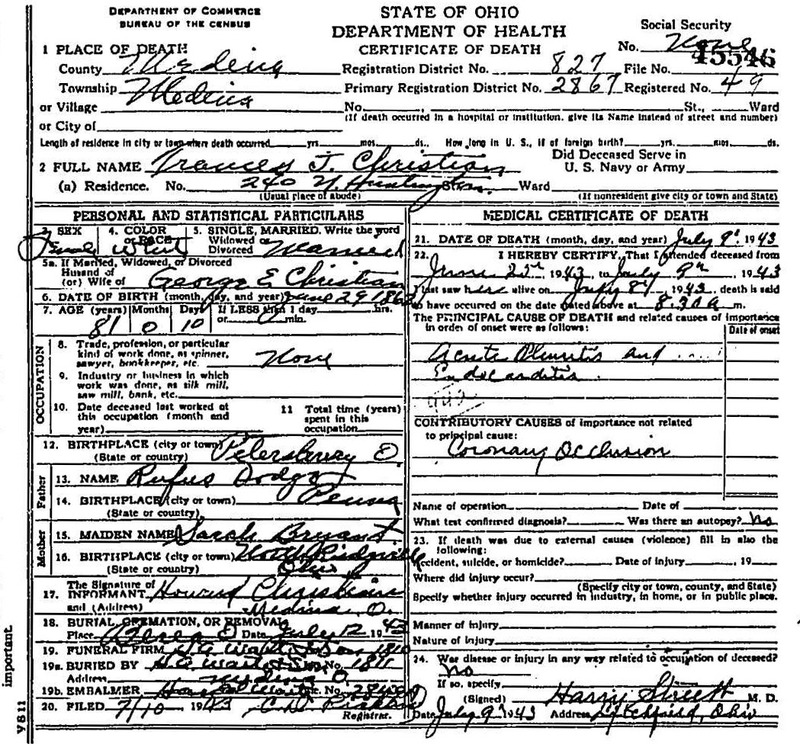 1 George Edward Christian, "Ohio, Deaths, 1908-1953"; "Ohio, Deaths, 1908-1953," index and images, FamilySearch (https://familysearch.org/pal:/MM9.1.1/X8NY-BMN : accessed 07 Feb 2014), George Edward Christian, 07 Feb 1917; citing Medina, Medina, Ohio, reference fn 12632; FHL microfilm 1983934. 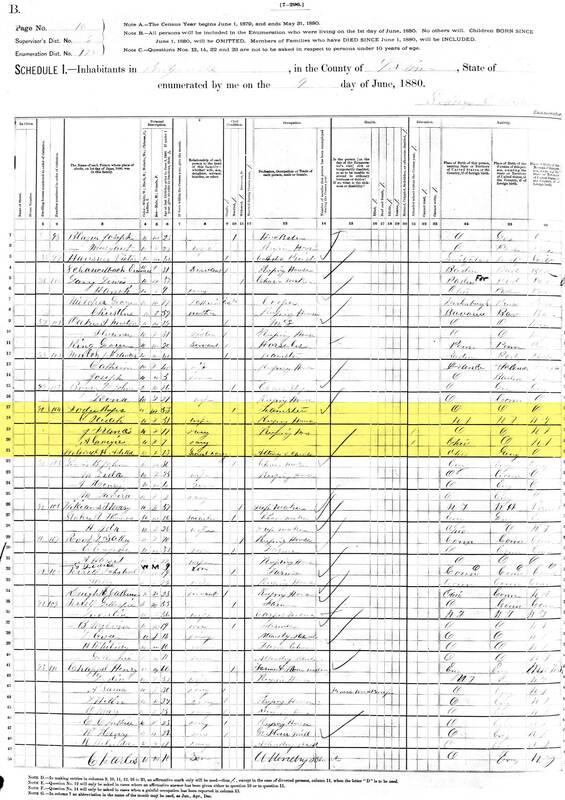 2 1880 United States Federal Census about George E. Christian; Year: 1880; Census Place: Berea, Cuyahoga, Ohio; Roll: 1009; Family History Film: 1255009; Page: 244C; Enumeration District: 068; Image: 0637. 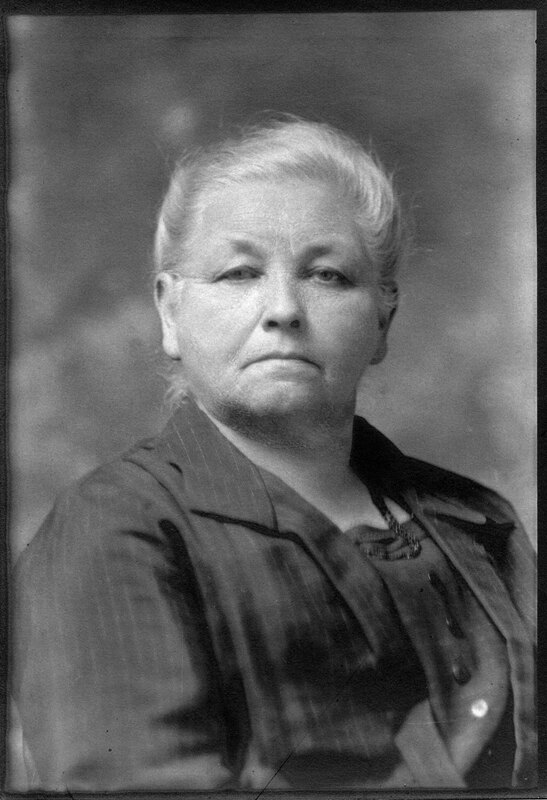 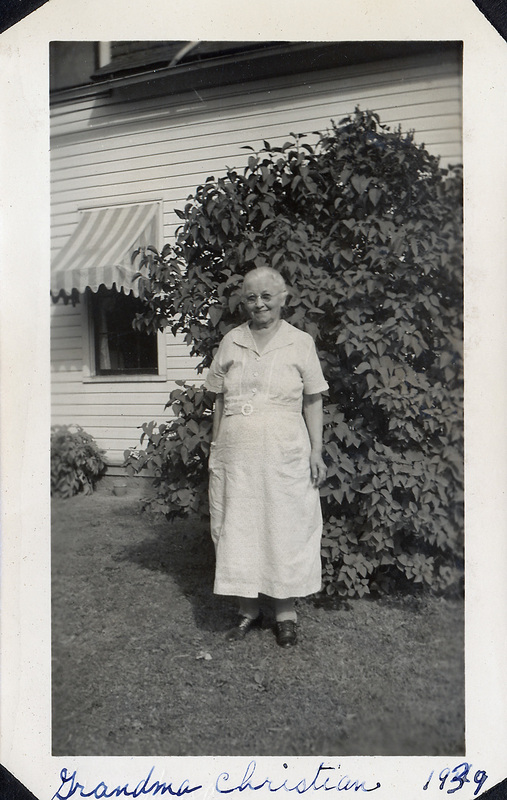 3 Frances J Christian, "Ohio, Deaths, 1908-1953"; "Ohio, Deaths, 1908-1953," index and images, FamilySearch (https://familysearch.org/pal:/MM9.1.1/X83L-L4C : accessed 07 Feb 2014), Frances J Christian, 09 Jul 1943; citing Medina, Medina, Ohio, reference fn 45546; FHL microfilm 2024137. 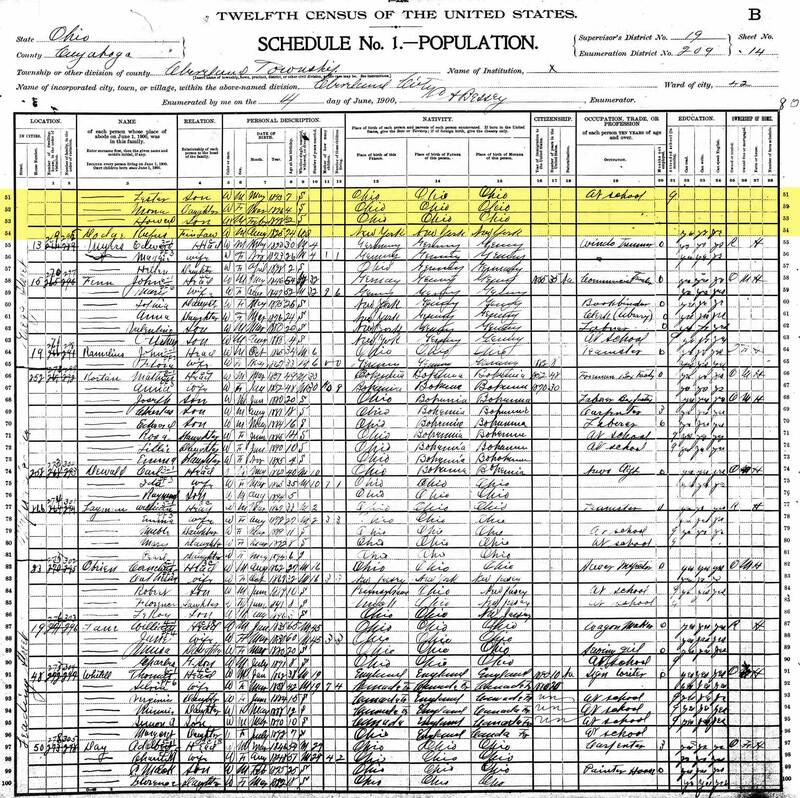 4 1870 United States Federal Census about Francis Dodge; Year: 1870; Census Place: Ridgeville, Lorain, Ohio; Roll: M593_1235; Page: 595A; Image: 581; Family History Library Film: 552734. 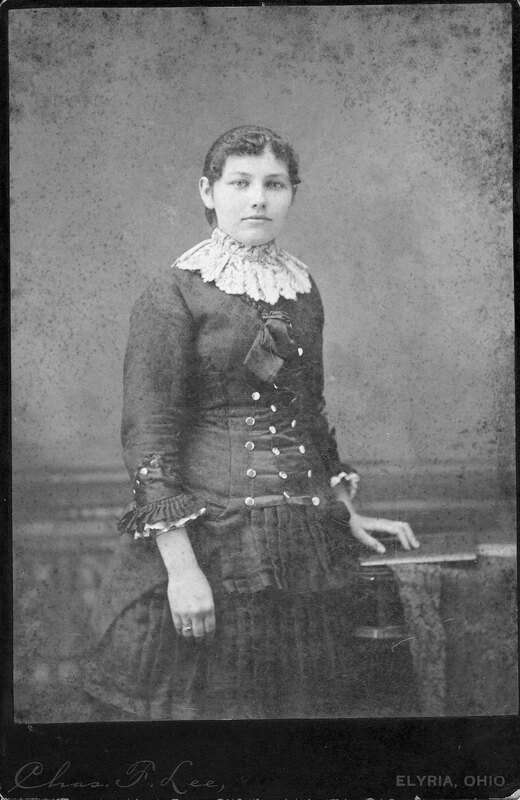 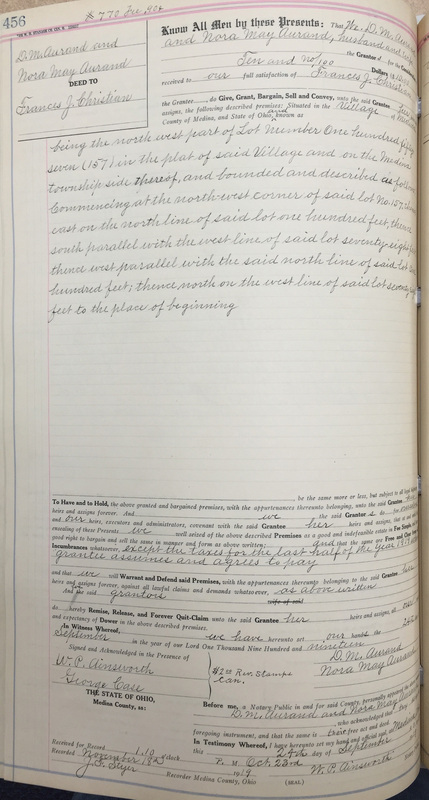 5 George Christian, "Ohio, County Marriages, 1789-1994"; "Ohio, County Marriages, 1789-1994," index and images, FamilySearch (https://familysearch.org/pal:/MM9.1.1/XZ2C-GXW : accessed 07 Feb 2014), George Christian and Frankie Dodge, 24 Feb 1883; citing Lorain, Ohio, United States, reference v 4 p 579; FHL microfilm 378293. 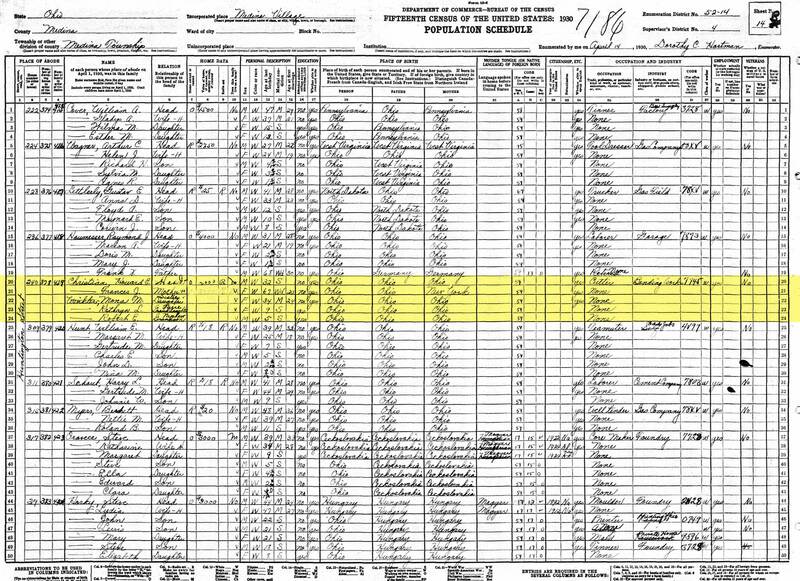 6 1900 United States Federal Census about George Christian; Year: 1900; Census Place: Cleveland Ward 42, Cuyahoga, Ohio; Roll: 1260; Page: 14A; Enumeration District: 0209; FHL microfilm: 1241260. 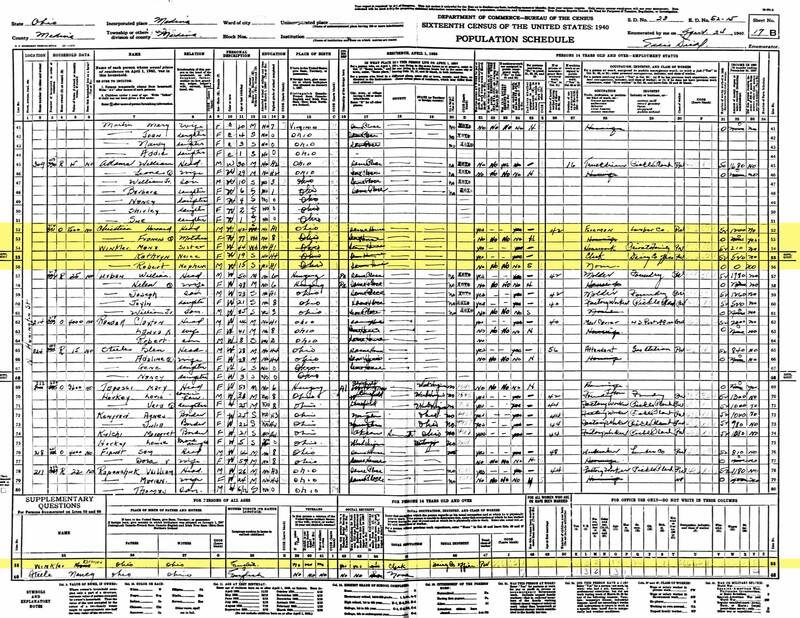 7 1910 United States Federal Census about George E Christian; Year: 1910; Census Place: Medina, Medina, Ohio; Roll: T624_1205; Page: 13A; Enumeration District: 0138; FHL microfilm: 1375218. 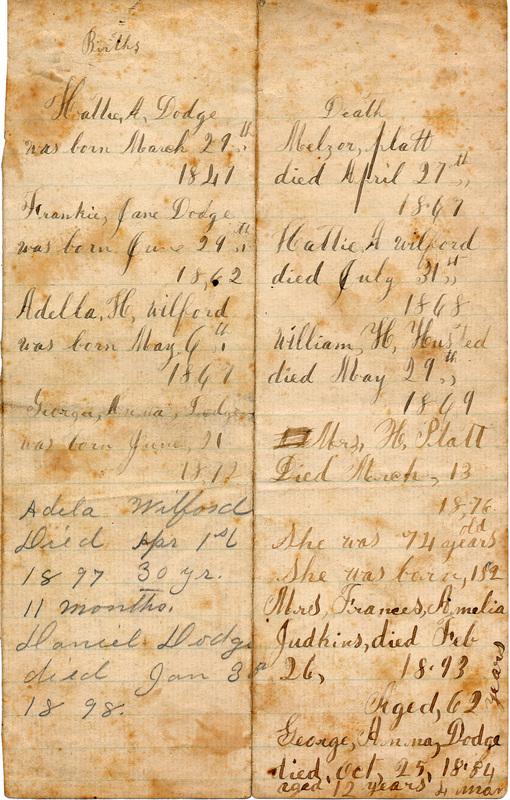 8 Obituaries of George and Edward Christian, 1917; The Medina Gazette Newspaper; Medina, Medina County, Ohio; Friday, 9 February 1917; Page: 1 & 10. 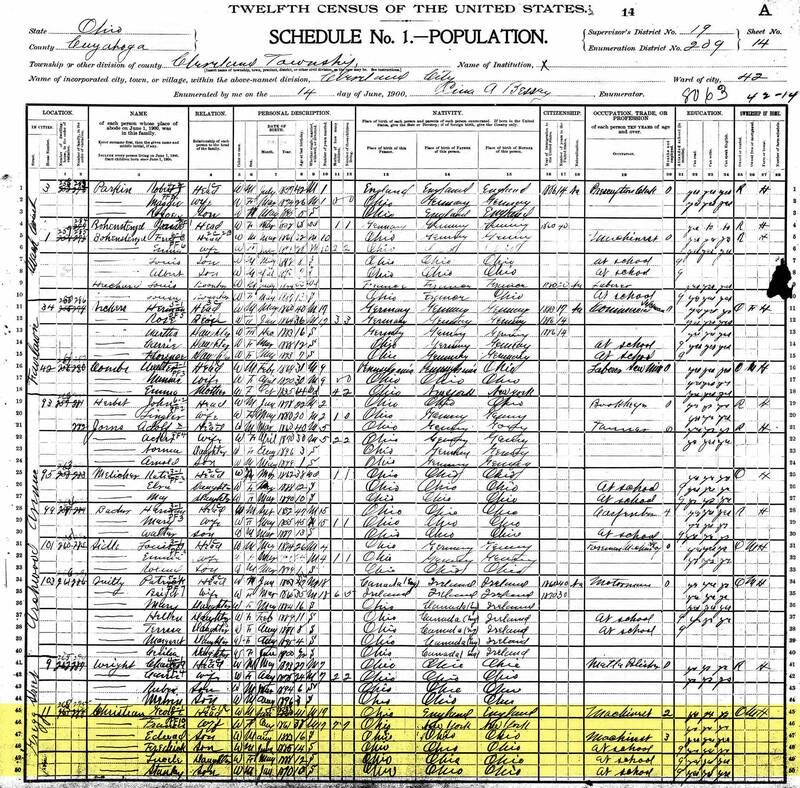 9 1920 United States Federal Census about Frances J Christian; Year: 1920; Census Place: Medina, Medina, Ohio; Roll: T625_1417; Page: 32A; Enumeration District: 75; Image: 340. 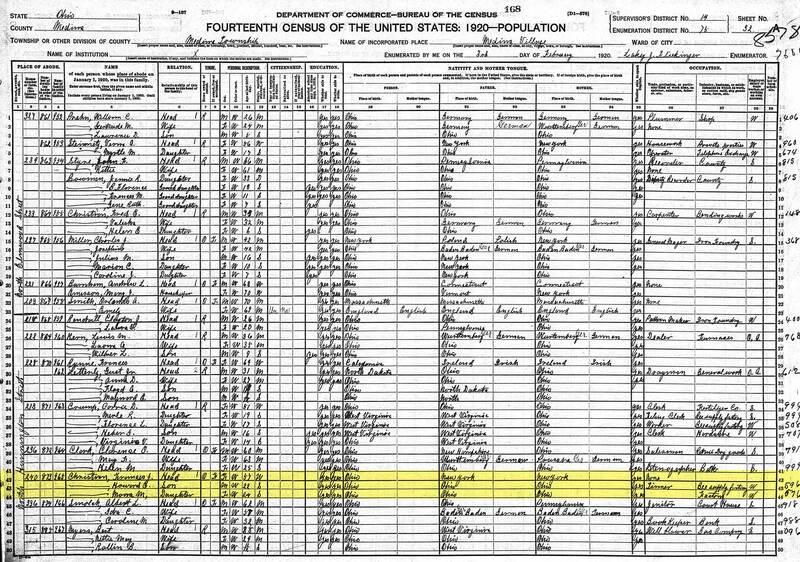 10 1930 United States Federal Census about Frances J Christian; Year: 1930; Census Place: Medina, Medina, Ohio; Roll: 1848; Page: 14B; Enumeration District: 0014; Image: 686.0; FHL microfilm: 2341582. 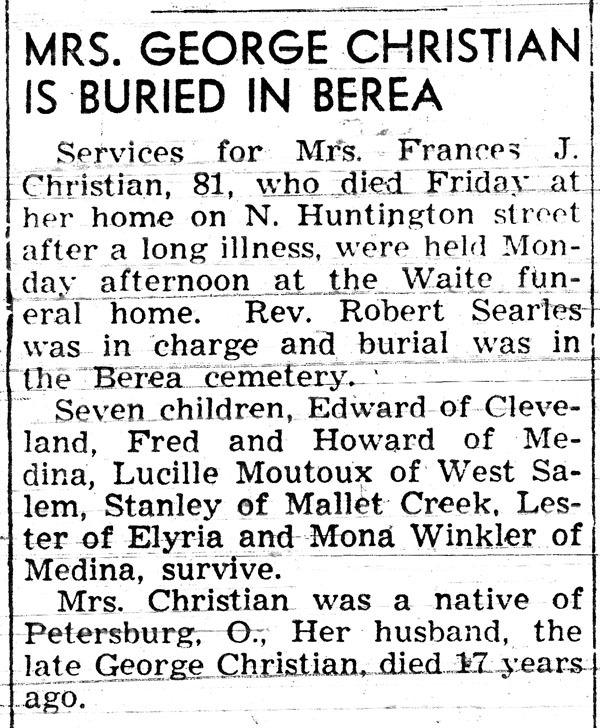 11 Obituary of Mrs. George Christian, 1943; The Medina Gazette Newspaper; Medina, Medina County, Ohio; Tuesday, 13 July 1943; Page: 3.